NAC to service Gore and Dargaville? 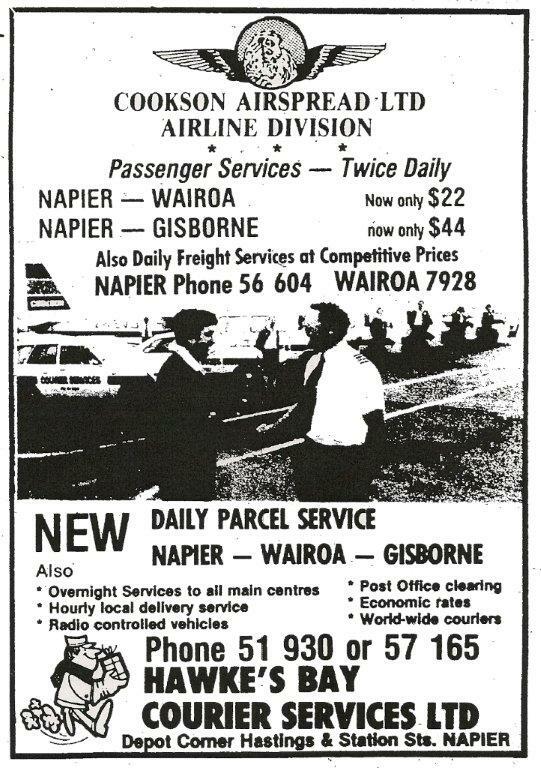 While doing some research on Wairarapa Airlines I came across this quite interesting article that appeared in the the Wairarapa Times age in September 1967. Intensive investigation into ways and means of continuing airline services into minor airports now served by NAC's ageing DC3s is being made by the Corporation and Civil Aviation Authorities. 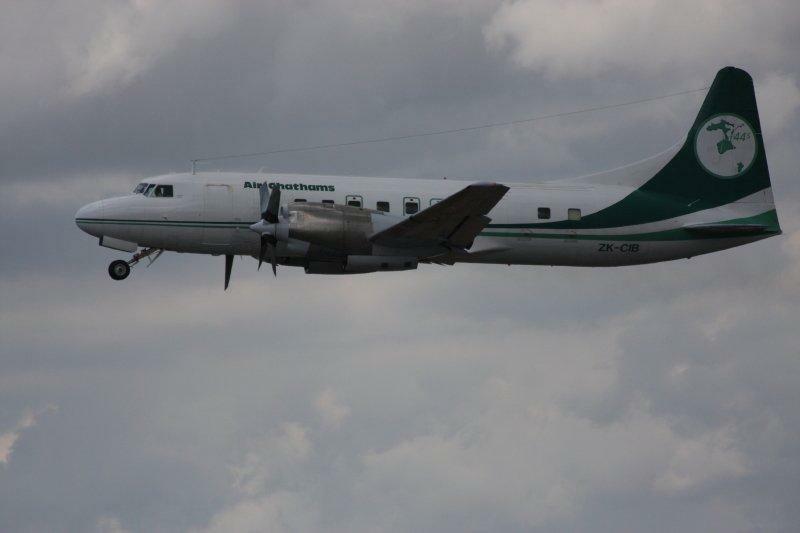 NAC has announced that it wants to retire the DC3s by December of next year and, while the Government agrees generally with this proposal, it also wants to ensure that towns at present linked by airline service retain it. DC3s were in the original fleet when NAC began operations in 1947 and remained the corporation's work horse for more than a decade. The introduction of jet-prop Viscounts and Friendships and the upgrading of secondary airports have diminished the role of the familiar DC3 in recent years. 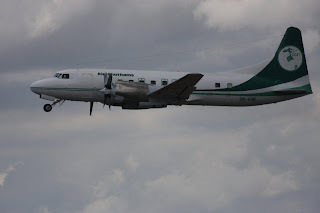 From a peak of 26, NAC's fleet of DC3’s has dropped to 11. Sentimental tears may be shed by some with the disappearance of, the old aircraft from the air lanes, but there will be little regret by accountants. While the DC3 makes a reasonable return on some sectors flown by NAC and Mt Cook Airlines, new restrictions make it totally uneconomic. In any case, NAC are not interested in running a four-plane fleet. They want to concentrate on their Boeing 737 pure jets when they start arriving- next August, the five Viscounts and the 13 Friendships. The 737 jets will operate between Auckland and Dunedin and with their introduction the Viscount service will be extended to Invercargill. The Friendships will serve such provincial centres as New Plymouth, Gisborne, Napier, Tauranga and probably Auckland - Whangarei. It is outside these centres that the real problems will arise with the retirement of the DC3. To take even Friendships some of the smaller airports would need expensive upgrading which would not be justified by the traffic offering. The three areas of most concern are Northland, the West Coast and Otago-Southland. Several alternatives for each area are now under consideration and if present plans can be carried through towns in these areas should retain a service, even if it is not operated by NAC. On the West Coast there are several possibilities. One proposal is a new link between Hokitika and Christchurch operated by a Friendship. Hokitika has only a compacted strip and the present proposal does not envisage sealing it. 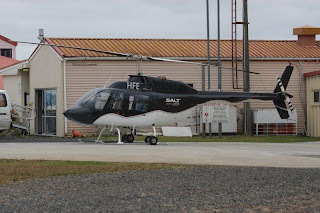 Instead the odd Friendship flight will be made into Hokitika to test the strip's strength and evaluate possible stone damage to the craft's hull. If this proposal is found practical, it could result in a small plane service, perhaps operated by a private company, feeding coast passengers from Westport and Greymouth to Hokitika. Another possibility is a private company operating northwards, perhaps to Nelson or Wellington to link with NAC services. On links between Auckland, Whangarei and other Northland centres there are a number of choices being considered. One would be to seal either end of the Kaitaia runway and operate Friendship but this appears a doubtful economic proposition. Another alternative would be to retain a DC3 for two years to operate the Northland service from Auckland. This would mean there would be no Friendship service to Whangarei. 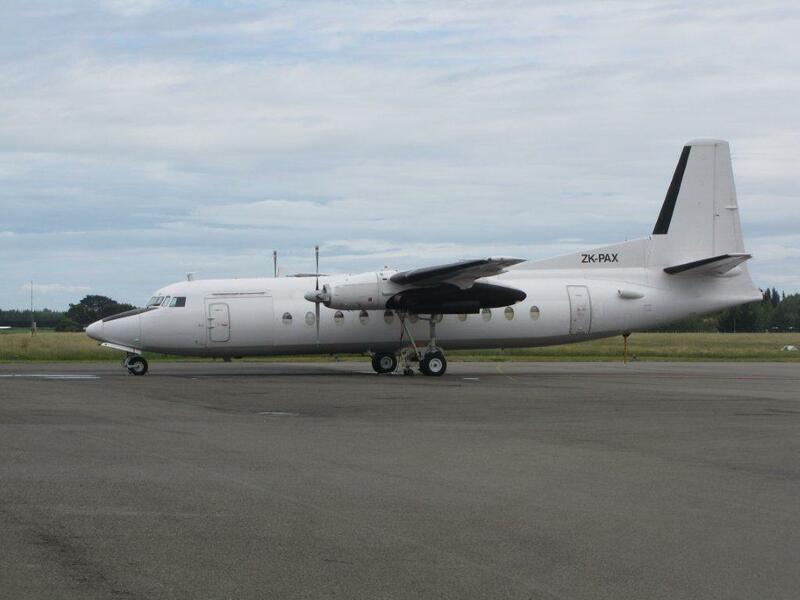 A third and possibly most likely choice would be to arrange for a private operator to service Northland towns under charter to NAC. Another alternative would be to abandon the services north of Whangarei, but this is most unlikely. 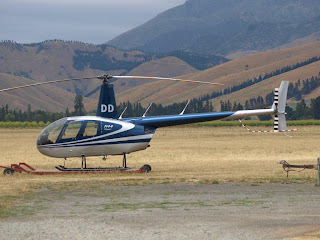 The Minister of Civil Aviation, Mr Gordon, is .operating a “round - Northland" service using a smaller machine. He has welcomed. the move by a private company to operate a service around central North Island towns using Cessna 402s. He hopes Masterton might eventually be included in this service. Two parties interested in operating a privately run Northland service are surveying the route. It is believed .that one operator is looking at the Norman Britten Islander, a plane very much like the Bristol Freighter with twin tail units. It can land and takeoff in 1000ft and provides a comfortable trip for eight or 9 nine passengers at 160mph. It is ideal for short stages. 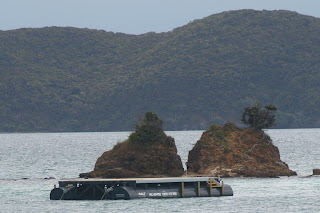 The service would act primarily as a feeder- to NAC at Whangarei. 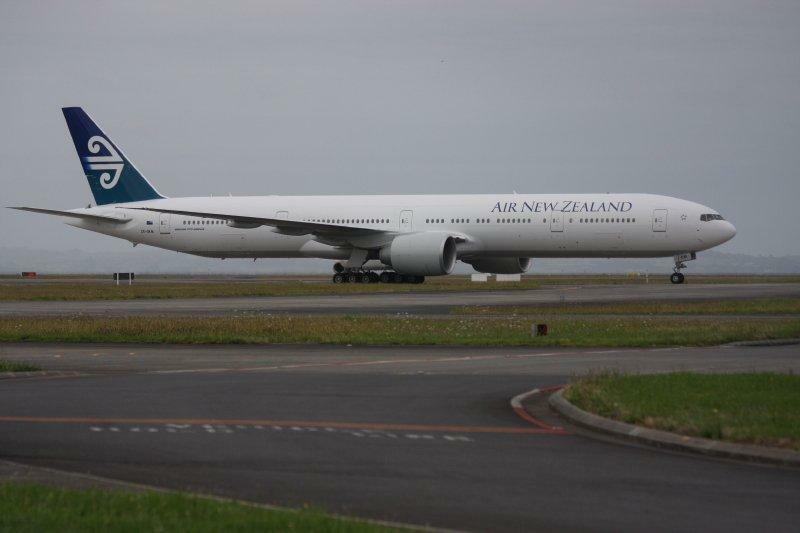 But should Dargaville be included, an application might be made for the service to extend to Auckland International Airport. 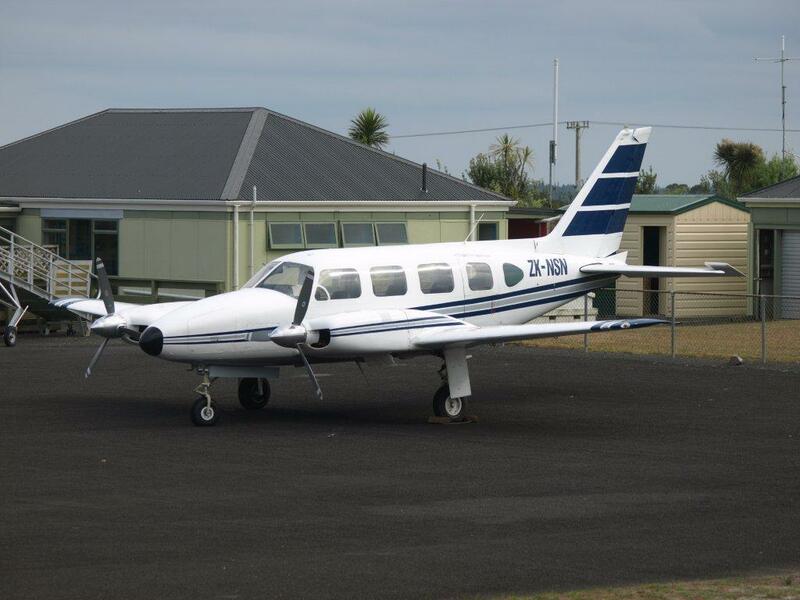 The proposed Northland service would not only open up Dargaville but could also feed into the difficult Kaikohe Airport and into Kerikeri. 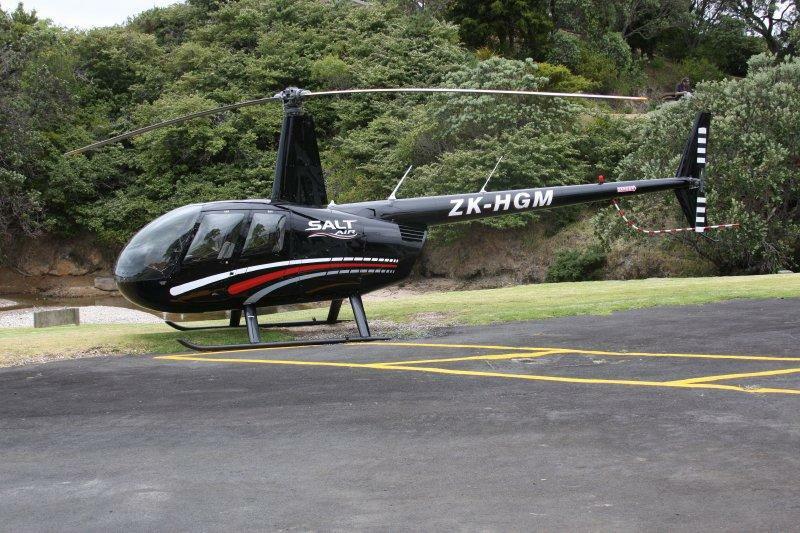 lt would operate on a route Whangarei-Kaikohe-Kerikeri-Kaitaia-Dargaville-Whangarei. It would then run on the reverse route with the possibility of three or more round trips a day. A service would.possibly require an NAC subsidy. This would be studied on the aspects of economics and the feasibility of the service but should receive sympathetic consideration. The Government is considering a similar proposal in the south. This would. operate on the Dunedin-Alexandra-Cromwell-Queenstown-Te Anau-Gore-Dunedin route. 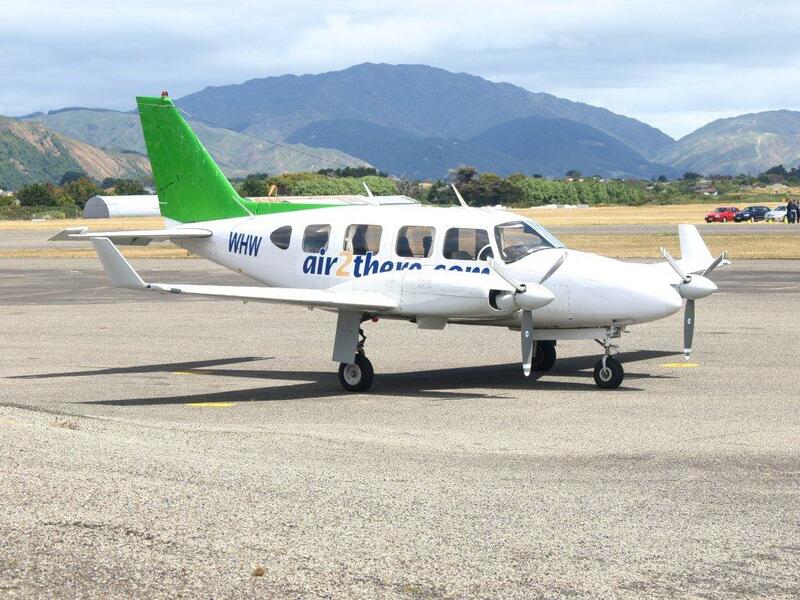 Mount Cook Airlines would, continue to operate the Oamaru-Timaru-Christchurch service on charter for NAC. While discussions these minor routes is proceeding, reports from the United States on the Boeing 737-200 have been excellent and there is no indication of any delay in deliveries. The first of the jets is due next August. 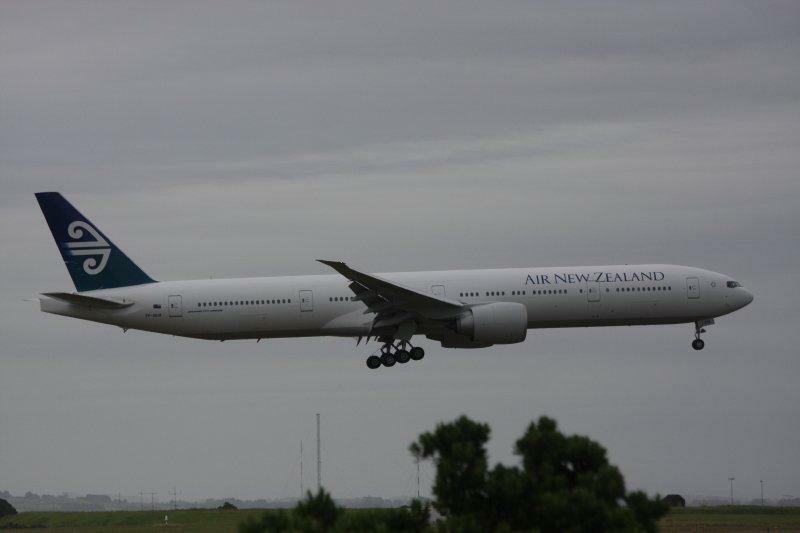 Wayne Grant captured the arrival of Air New Zealand's first Boeing 777-300ER ZK-OKM (c/n 38045)arriving at Auckland this morning. It is due to commence scheduled operations on the 10th of January 2011. 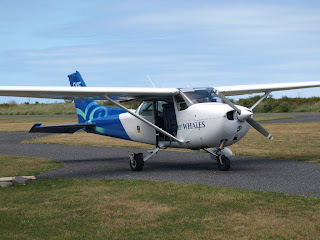 Auckland Transport will open a new airport terminal at Claris, Great Barrier Island on Tuesday, in association with the Great Barrier Island Local Board. Work on the $1million terminal began in early July 2010 and was completed a month ahead of schedule and to budget. A major feature of the new building is sustainable building materials and design. It utilises green technology such as natural ventilation, solar panels, on-site water treatment units, maximises natural lighting and where possible locally sourced resources and materials were used. Artwork and a carved pou whenua standing at the terminal’s entrance were commissioned from local artists. The new airport terminal’s electrical energy requirements will be primarily provided through an impressive array of photovoltaic solar panels mounted on the roof. The terminal is also provided with an efficient solar heated hot water system, also mounted on its rooftop. Great Barrier Island has no reticulated electricity or fresh water. Solar panels and wind generators provide most of the island’s residential dwellings with their electrical energy requirements. Calling the new terminal a crucial transport asset Paul Downie, chairperson of the Great Barrier Island Local Board, says the investment will provide an even better experience for tourists, and residents as well as improved facilities for airline and freight operators, and showcase the island as a sustainable community of the future. 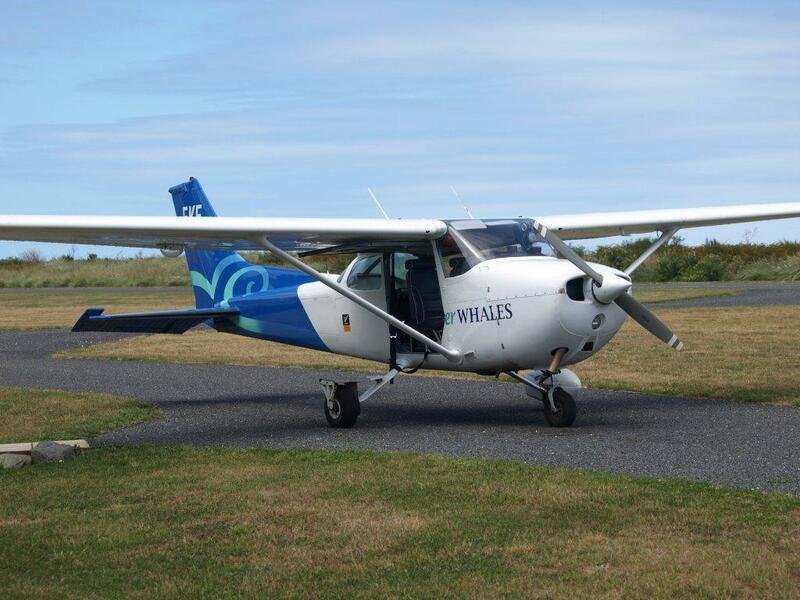 “The Claris Airfield Terminal is a key gateway to the island for tourism, local businesses, holiday makers and locals. This is a significant investment in the community and I believe it will bring economic benefits to the island in a very meaningful way. 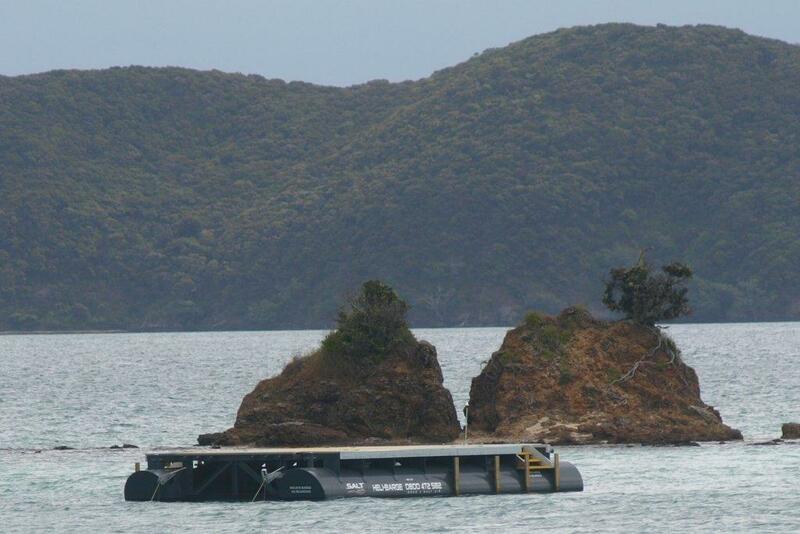 “Great Barrier Island has the potential to be showcased as New Zealand’s alternative energy capital. Claris Airport Terminal is an eco-friendly airport running on sustainable, renewable energy. “Claris Airfield now has a functional space with improved facilities for passengers and airline operators, a new visitor information area and secure overnight freight storage. Mr Downie also acknowledged the role of Auckland Transport in completing the project, Auckland Council, Great Barrier Airlines, Fly My Sky and the Great Barrier Island Local Board. “The partnership between all the parties and their input on the design has been invaluable in creating a landmark building which reflects the culture of the island community,” says Mr Downie. 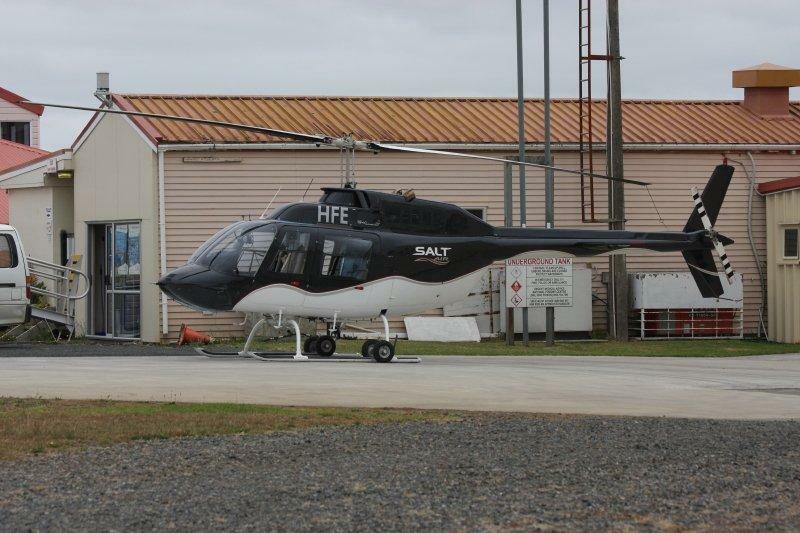 Emergency situations on the remote island have been considered in the design with enhanced access facilities for emergency services and improved facilities for the Auckland Rescue Helicopter. Cool Auction this one! I have a family of starlings that are for sale. They are very sweet, caring parents, raising lovely little chicks but unfortunately they are living in my plane. So having the heart of gold that I do, I simply cannot evict them - so I have decided to put them up for sale, and give the buyer their home - my 1981 Embraer Banderante. You could build the ultimate kids playhouse, sleepout, flight simulator or just have the biggest garden ornament on your street. The wings come off for easy shifting, and the fuselage can be transported on a flat deck semi trailer. 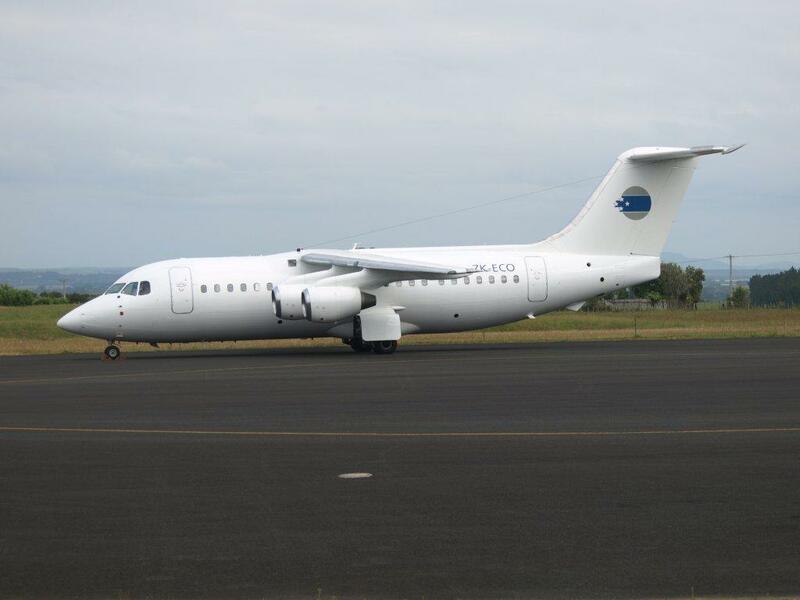 This old Banderante belonged to CityJet - a small airline that flew in NZ in the 90's. CityJet went out of business in a huge scandal involving the CAA and Air NZ, and was investigated by Ian Wishart - so the plane has some cool history. The Embraer Banderante was originally designed by the Brazilian military as a light troop transport aircraft. The rear door of the plane can be removed so paratroopers can jump out. 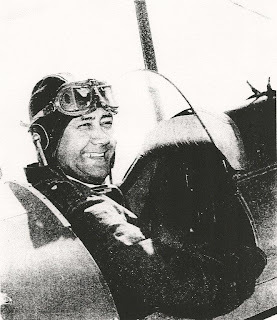 The Banderante was also fully aerobatic and could be barrel rolled. It was converted to civilian use, and was hugely popular around the world, however there are no longer any Banderantes' flying in NZ. It is widely known that many were used in Columbia as cocaine transport aircraft. 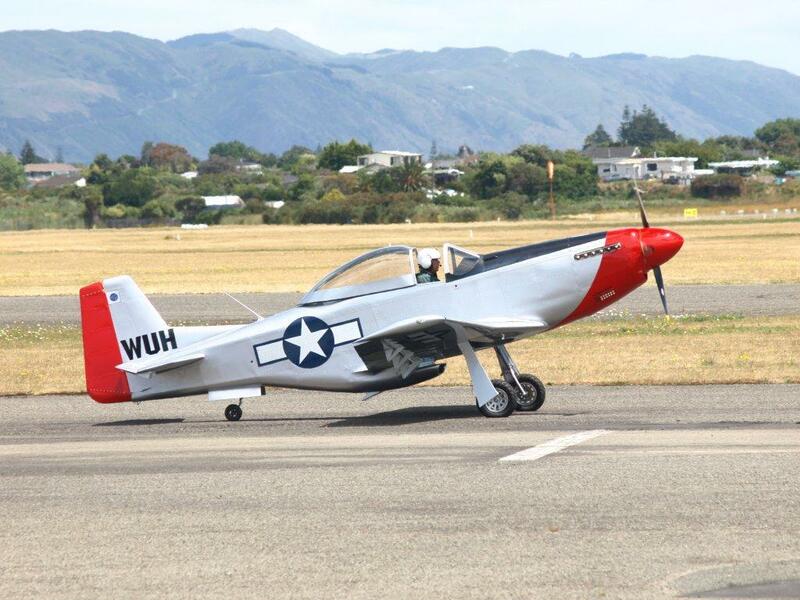 Definitely a NZ aviation icon. As you can see by the photos the old Banderante needs a loving new owner. My intentions were to build it into a cool sleepout type cabin to go along with my Fairchild Metroliner which I have done up for my kids. However I am simply just too busy with life to finish it. I don't want this to go to the scrap man - I would love it to go to someone who is interested into turning it into something cool. So my start price reflects the rough value of the aircraft in scrap. The last two photos are of the cockpit, and nose of the Metroliner which is 90% completed, and as you will see has come up really good considering the Metroliner was in a terrible state when I started. I am now in Christchurch for the summer break and it is COLD. 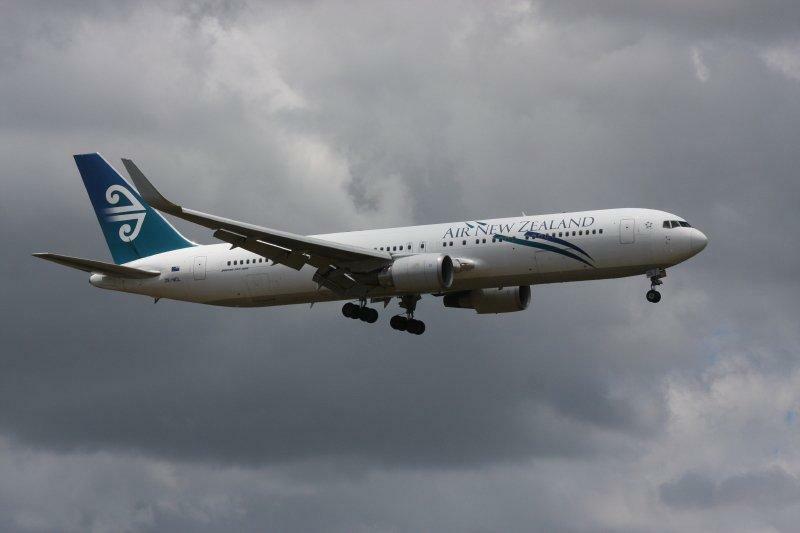 Air NZ services from Wanganui to Wellington will take a break during the holidays. Eagle Air, the airline's wholly owned subsidiary, provides the capital link but will park its Beechcraft 1900D aircraft for almost a month from Christmas Eve until January 19. Carrie Hurihanganui, general manager of Eagle Air, said the temporary grounding recognised a lack of demand during the holiday period. "It's something we have done before, both with our Wanganui services and other short-haul routes," Ms Hurihanganui said. "Our decision is principally business-driven because demand tends to fall away during this period." Ms Hurihanganui said it certainly did not indicate anything other than a drop off in patronage. 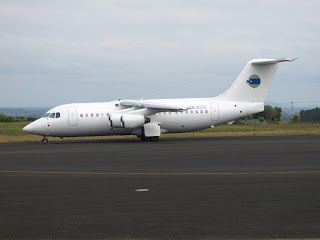 Currently Eagle Air flies from the city to Wellington Monday to Friday, the outward flight leaving at 7.05am and the return flight leaving the capital at 7pm. There are no weekend flights. 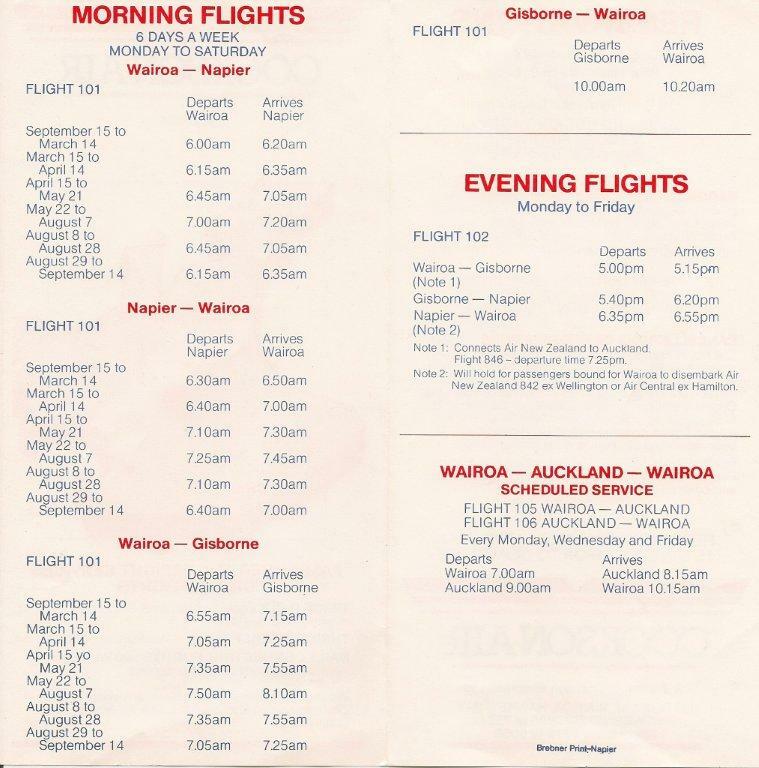 Eagle Air first flew into Wanganui in 1973 when it began a Hamilton-Wanganui service. 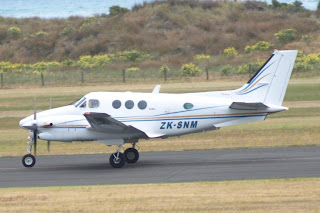 Air NZ purchased a 100 per cent share in the company in 1992 and the subsidiary operates 18 Beechcraft on the airline's domestic network. Eagle Air specialised in operating low capacity aircraft on low traffic, low density routes. 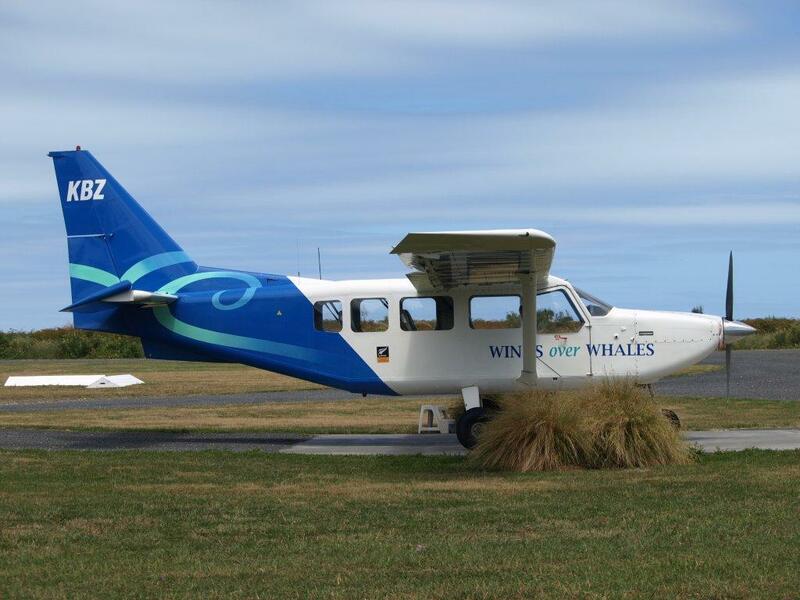 The trial of an extended flight service between Wanaka and Christchurch continues while flight numbers are collated. Following pressure from tourism and business sectors, Air New Zealand subsidiary Eagle Air increased the number of flights on its Christchurch-Wanaka route by 40 per cent in August. The new schedule has been trialling twice-daily flights on Monday, Wednesday, Friday and Sunday with one flight on Tuesday, Thursday and Saturday. Previously the company operated one return flight between the two centres from Monday to Saturday and two Sunday flights. Eagle Air general manager Carrie Hurihanganui said there was no doubt more passengers were travelling but it was too early to make any definite decision on the success of the new service. She was to meet with Lake Wanaka Tourism general manager James Helmore in the next week. Ms Hurihanganui said the airline was " not unhappy" with the number of passengers. 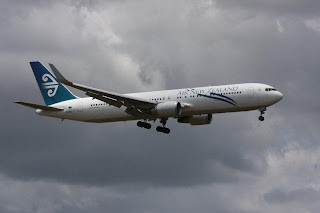 An investigation into why a cargo door opened on an Eagle Air flight between Auckland and Whangarei has revealed baggage loaders have been forgetting to lock cargo doors. If the door which opened mid-flight had broken off the Beech 1900D it could have smashed into the tail and potentially caused a major problem. 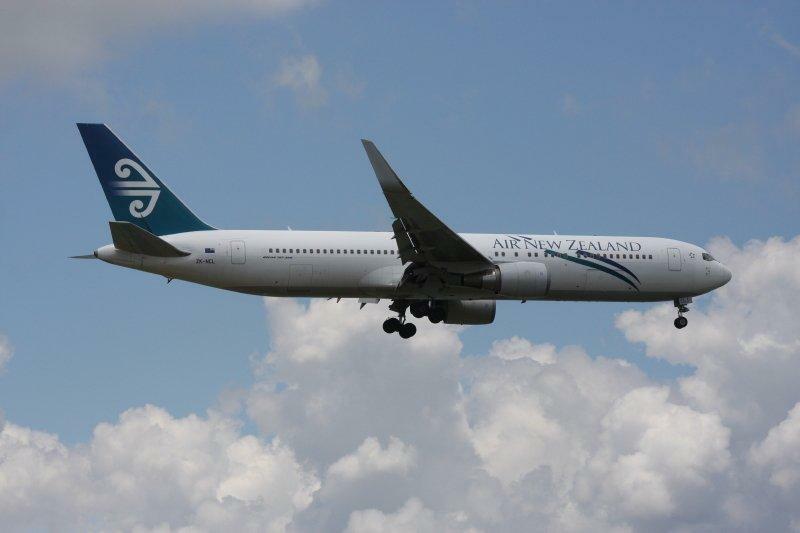 The flight with nine passengers and two crew had to make an emergency landing soon after taking off from Auckland on April 8. A Civil Aviation Authority investigation shows the door had not been locked. Loaders usually closed doors but did not lock them while they waited for late bags. The CAA also found the paint had worn off the button which made it difficult to confirm if the door was unlocked. Staff had not been trained sufficiently in "cargo door button operation". The Transport Accident Investigation Commission (TAIC) is also investigating the incident. Its report won't be released before April next year. William Bolton (Bill) Cookson formed Cookson Airspread Ltd in 1953. His company was probably more known for aerial topdressing but for almost 40 years the company offered scheduled services from Wairoa to Napier, Gisborne and, for a number of years, Auckland. 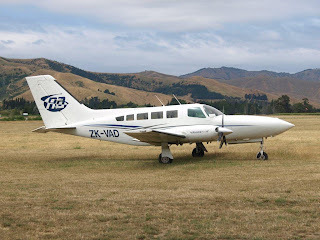 The first move towards a scheduled service was taken in October 1957 when Cookson Airspread was granted a charter licence with the company taking delivery of a Piper Pa22-150 Tripacer, ZK-BSD (c/n 22-5548), in December 1957. The Wairoa Star proudly praised the virtues of the Tripacer in its report on the new arrival. “The new aircraft is larger than any other type already in the district and offers a maximum in travel comfort. Because of its American manufacture it possibly possesses a measure of luxury in respect of passenger and pilot than many other aircraft in operation today The construction makes the plane faultless in appearance and it is designed for absolute safety. The two forward seats are ‘bucket’ shaped and the rear seat is for double accommodation. The seats are upholstered in red leather with a silver and fawn threaded furnishing inlay. They are also adjustable to permit passengers to relax. An unusual feature adding to air travel comfort is that passengers are permitted to smoke whilst in the air and ashtrays and a cigarette lighter are installed for this purpose. Vision is unrestricted and air vents in the perspex windows give excellent ventilation whilst heating and cooling provides the utmost in air conditioning.” Never before have the praises of a Tripacer been so highly sung! 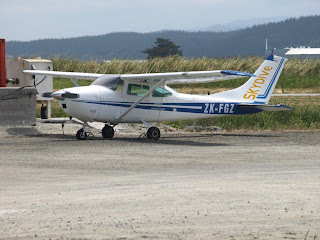 Cookson Airspread's Cessna 180, ZK-BVQ at Wairoa. BVQ introduced the Dominion newspaper service with Petersen Aviation before the service and the Cessna was bought by Cooksons. The move to scheduled air service happened in July 1957. 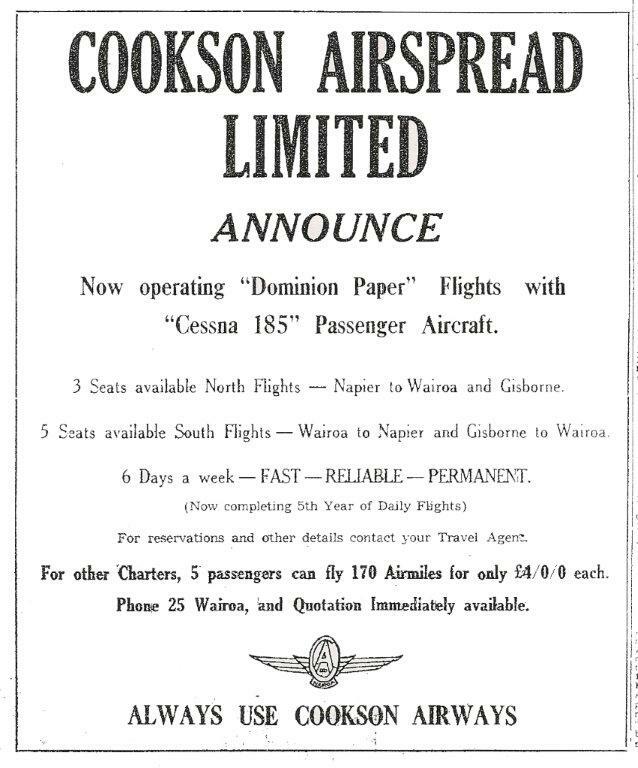 The Wairoa Star of 23 July 1958 reported that Cookson Air had taken over the Dominion newspaper service that had been started by Petersen Aviation in late 1957. 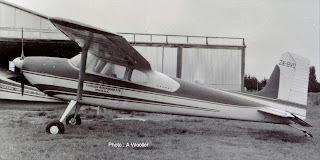 To serve the newspaper contract and provide for passenger and freight Cookson’s bought Petersen’s Cessna 180, ZK-BVQ (c/n 31342). This continued the service until 1963 when it was replaced by a larger Cessna 185, ZK-CAK (c/n 185-0017), number 17 off the production line. Over the years a number of aircraft were operated on the service. 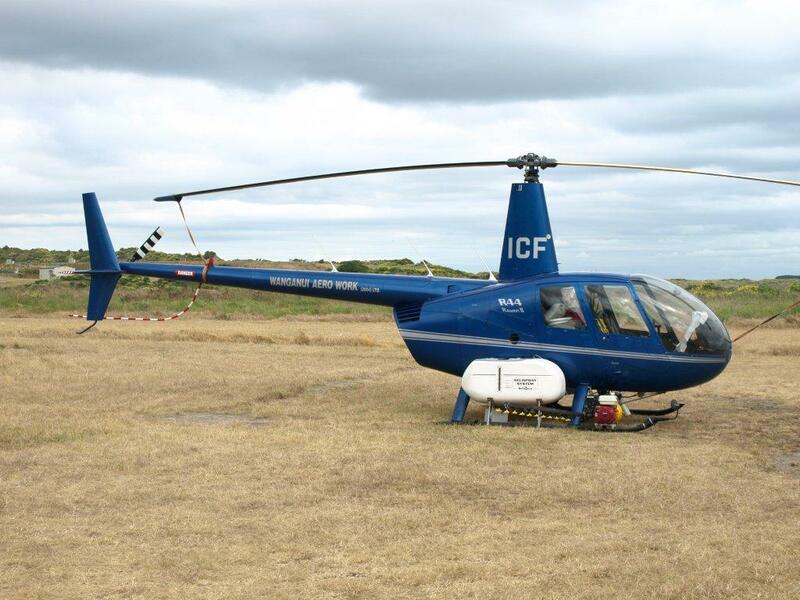 The company was bought by Manawatu Aerial Topdressing Ltd in June 1967. Cookson Airspread Ltd continuing to operate under its own name as a fully owned subsidiary of the Manawatu Company from this time with Bill Cookson continuing to managed it until about November 1969 when he retired from aerial topdressing. A Cessna 172, ZK-BWL (c/n 47320), was also used in the early 1970s. 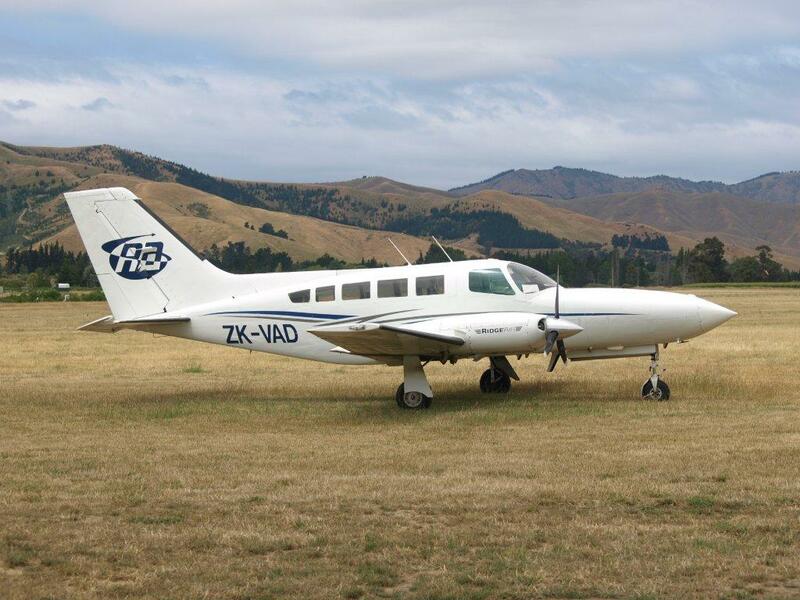 On the 22nd of February 1978 a twin engined aircraft was registered to the company in the form of Piper Pa23-250 Aztec D ZK-CUS (c/n 27-4499). 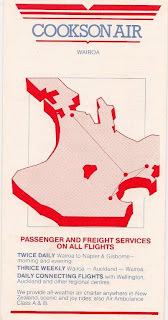 This maintained the services to Gisborne and Napier. A later addition to the fleet was Cessna 172A ZK-BWL taken at Fielding in June 1974. Piper Aztec ZK-CUS at Wairoa on 4 November 1980. 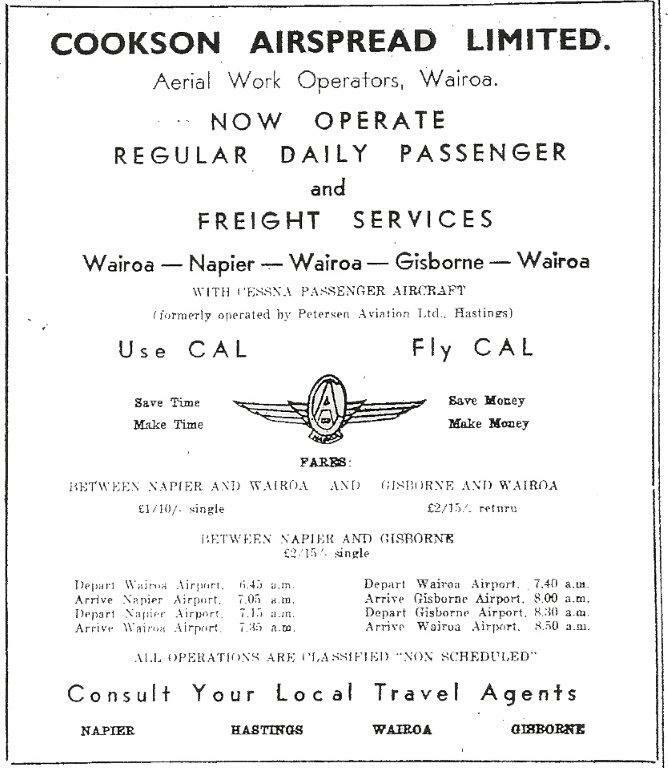 Cooksons were not only the operator offering flights into Wairoa. 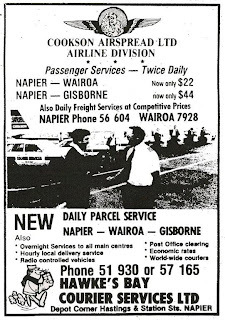 In the mid-1970s Databank’s weekday courier service from Auckland to Gisborne, which was operated by Akarana Air, was extended to Wairoa. 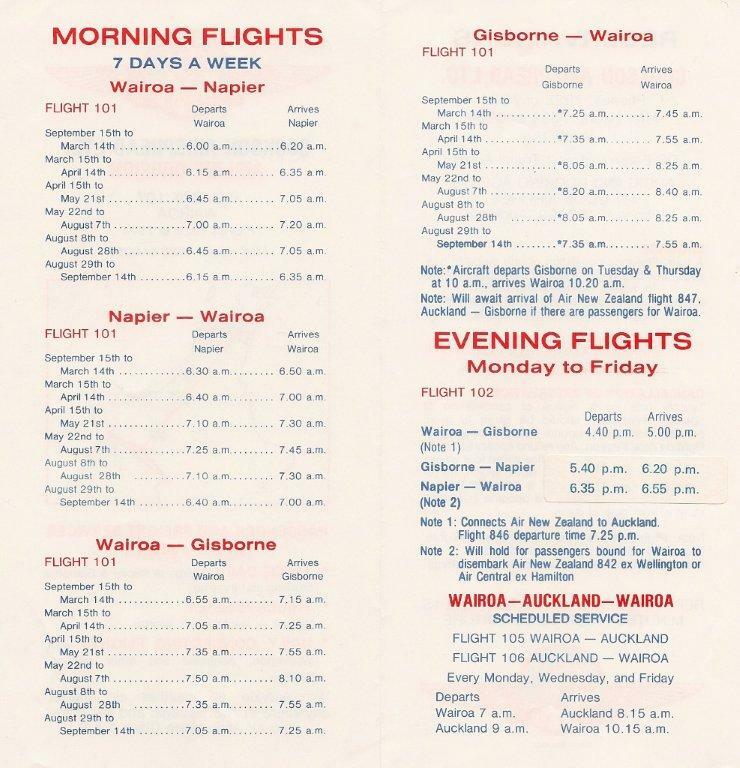 In 1976 Akarana Air added a three times a week direct air service from Wairoa to Auckland. This company underwent various ownership changes until in 1979 an order to wind up Nationwide Air (Akarana) was made. 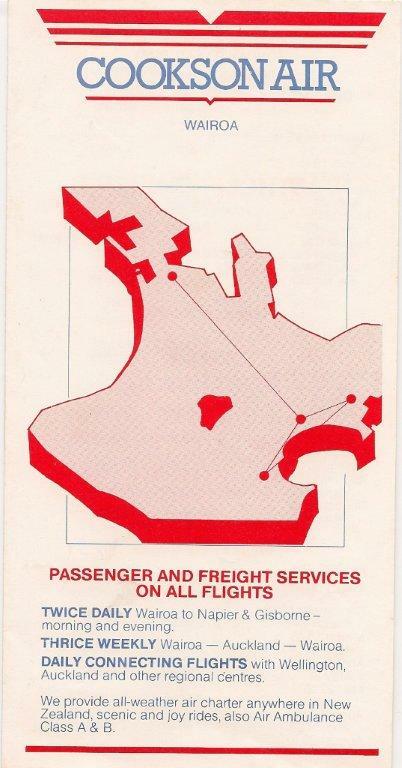 While this was in process D H R Wilkie Ltd of Auckland and Cookson Airspread applied for a licence to operate the Wairoa–Auckland service. 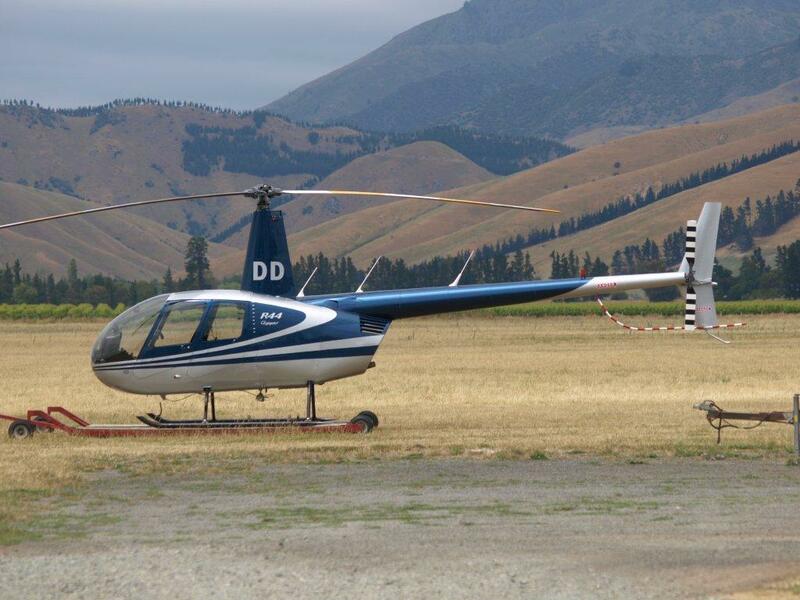 The Air Services Licensing Authority granted in favour of Cooksons a non-scheduled licence to operate three flights per week between Wairoa and Auckland. 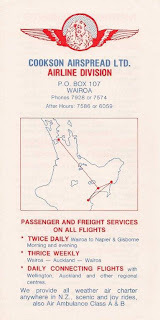 These flights commenced on 4 May 1979 after Akarana suddenly withdrew their service. Flights departed Wairoa at 7.00 am on Mondays, Wednesdays and Fridays arriving in Auckland at 8.30 am with the return flight leaving at 9am, arriving back in Wairoa at 10.30am. 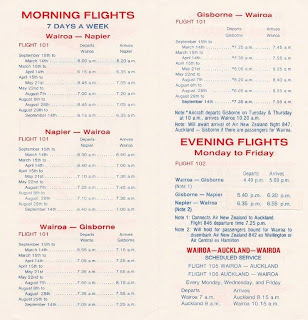 This timetable enabled Auckland businessmen to come to Wairoa for the day and return on the Wairoa to Gisborne or Napier feeder service connecting with Air New Zealand to Auckland the same evening. Later in 1979 Piper Pa32-300 Cherokee 6, ZK-DOP (c/n 32-7440045), was added to the fleet while Piper Pa23-250 Aztec F ZK-EVP was registered to Cooksons on the 10th of October 1980 and to replace the older Aztec, ZK-CUS. For Sale - Cook Airspread's Piper Cherokee 6 ZK-DOP taken at Ardmore on the 18th of May 1984. Piper Aztec ZK-EVP taken at Napier on the 20th of January 1992. In 1984 the company made a $100,000 investment in Wairoa's future by adding Britten Norman BN2A-26 Islander ZK-EVO (c/n 785) to the fleet as the Aztec had not been able to cope with the growing passenger and freight demand between Wairoa, Gisborne and Napier. The Islander, which was relatively cheap to operate, was also ideally suited for Cooksons’ mixed freight and passenger requirements on the short sectors. The Islander was mainly used on the morning newspaper service run but it was also operated on the data bank service in the evenings as well as being available for charter and air ambulance work. Britten Norman Islander, ZK-EVO, taken at Wairoa on the 8th of May 1984. In 1985 Basil Forster-Pratt took over as managing director and in 1986 he announced that the airline and topdressing divisions were being separated, the airline taking the name Cookson Air while the topdressing division was keeping the name Cookson Airspread. 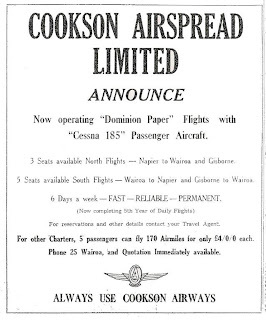 At the same time Cookson Airspread combined with Gisborne’s Farmers Air Ltd but locally kept the name Cookson Airspread. 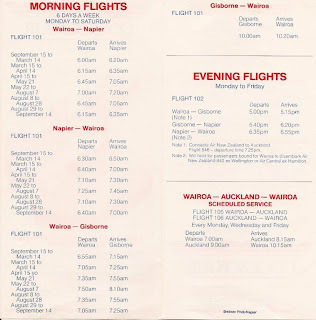 In July 1987, major changes were occurring with Air New Zealand services with Eagle Air taking over Air New Zealand’s flights to Gisborne but also a decreasing of traffic. This necessitated a rescheduling of Cookson’s timetable and a change in the fleet. 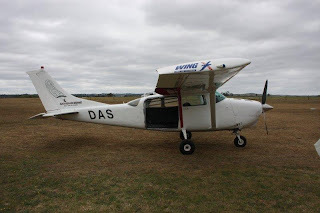 The Britten Norman Islander was sold to Aspiring Air of Wanaka with Cessna 177RG Cardinal joining the fleet for a year or so at the same time. 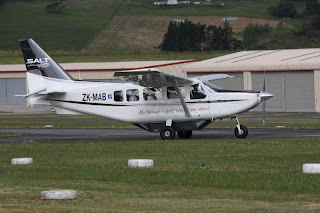 The Aztec maintained the services while awaiting the arrival of the Islander’s aircraft, Cessna T207A, ZK-FQA Stationair 7 (c/n 207-00455), the flights to Auckland were reduced to twice a week operating in the middle of the day. Cessna 177RG ZK-DPD taken at Wairoa on the 21st of January 1992. Cessna 207 ZK-FQA in her two colour schemes. Above, at Gisborne on 22 January 1992 and below, at Napier on 19 December 1993. 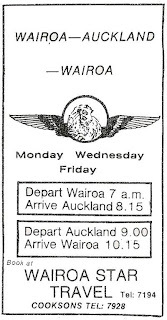 For a time the service was extended north from Gisborne to Ruatoria but this was unsuccessful. Problems were also experienced with loadings on the flights to Auckland and these too were unable to be sustained and they subsequently ended. With the improvement of the roads between Napier and Gisborne it was inevitable that the Dominion newspaper would eventually go by road. This happened in mid-August 1991 when Cookson Air lost the Dominion contract. Managing director, Maurice Forster-Pratt told NZ Wings that this and loss of a Databank document courier con-tract, put the airline “in survival mode”. This left Cooksons with a much reduced courier and freight operation with the generally small number of passengers the service carried. To stimulate growth the company’s base was moved from Wairoa to Napier but on the 1st of October 1994 the base was moved back to Wairoa. 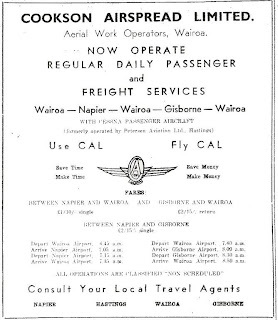 At this time an increased schedule was introduced with three flights from Napier to Wairoa, and two flights back from Gisborne with a connection being available to Palmerston North in the afternoon. 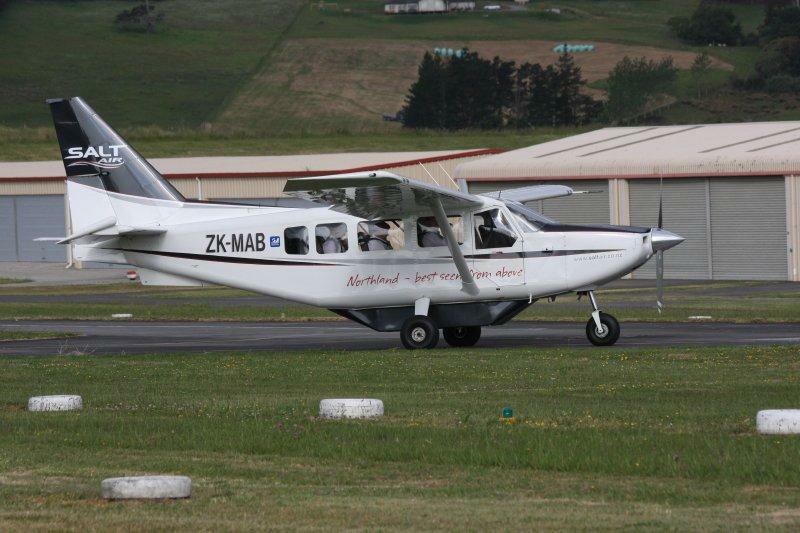 The Cessna 207 was sold leaving ZK-EVP, the “Spirit of Wairoa”, the sole aircraft in the fleet. 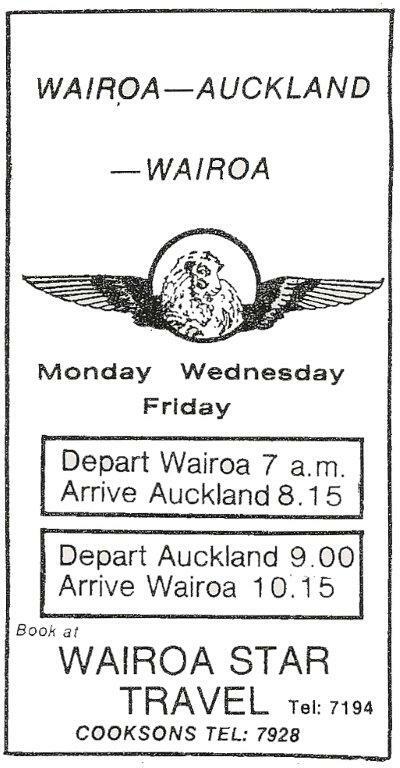 The end was nigh, however, and on the 13th of February 1995 the Wairoa Star reported that both Cookson Air and Cookson Superspread had suspended all their services on the 3rd of February. The Aztec required “mandatory heavy maintenance requirements” and no aircraft was available for rent which was suitably priced to allow the service to continue. Sadly this ended the story of one of New Zealand’s longest lasting third level airlines.